Over the last few years, I’ve noticed something exciting happening in my hometown, San Jose, California. While my city has never had the coolness cred of our neighbor to the north (San Francisco), San Jose is having a bit of a moment. I’m in love with big cities. Seven years ago, after finishing a Master’s degree in loving big cities (i.e. urban planning), I left Los Angeles and followed a boy to San Jose. At the time, I would have preferred to live in San Francisco but said boy (who hates to commute and works in Silicon Valley) refused. In the years that I’ve lived here, I’ve watched Downtown San Jose grow and develop into a vibrant urban community of its own. There are more things to see and do here than ever before, and there seems to be a growing pride among locals and an appreciation for the quirky things that make our city unique. While there are still plenty of sleepy, cookie cutter suburban neighborhoods on the outer reaches of San Jose, the neighborhoods surrounding the city’s core are diverse and interesting. There’s plenty here to make city lovers fall in love. While most other big California cities are similarly diverse, San Jose has a unique mix of cultures influenced by the city’s history and present draw of Silicon Valley. There are huge populations of Mexican, Vietnamese, Chinese, Indian, Portuguese, Italian, Ethiopian, Japanese, and native Hawaiian families who have lent their food, music, celebrations, and architecture to the city. Maybe my favorite thing about this community is how this city revels in nerdiness and is accepting of whoever you are, whatever you wear, or whatever little-known subculture you affiliate with. Intelligence and innovation are valued above anything else, and there’s no pretension… anything goes. (Techies in San Francisco have some more rules about how to dress and even how to grow their facial hair). There’s a really strong creative community in San Jose and much of the art is influenced by technology. The annual SubZERO Festival mentioned above is a great celebration of this creative experimentation, and local galleries, like Anno Domini, the San Jose Institute for Contemporary Art, and Kaleid Gallery are usually filled with art the plays with the idea of technology and the culture of Silicon Valley. 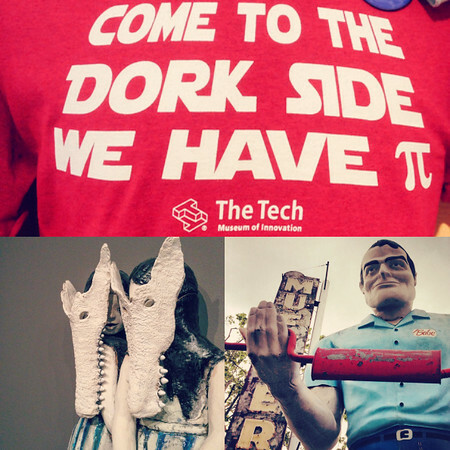 TechShop is a membership creative community for anyone who has an idea and wants to make something–join and have access to millions of dollars in industrial computing equipment and professional craft machinery as well as and courses in technical crafts, construction, and engineering. The Tech Museum of Innovation in the heart of Downtown is a great place to check out exhibits on the role of technology and innovation in our lives. I went a few weeks ago and was a big fan of the earthquake and space engineering exhibits (including an earthquake simulator and a chance to ride around wearing a NASA jetpack). Prior to the 1960s, the Santa Clara Valley was called “The Valley of Heart’s Delight.” This area around San Jose was prized for having the most productive agricultural land in California and the largest fruit production and packing region in the world. Early San Jose was a small historic downtown, surrounded by thousands of acres of fruit orchards. Legendary civil rights activist Cesar Chavez lived here for many years and got his start organizing farm workers here. For a walk through local history, History Park is a city park devoted to sharing the Santa Clara Valley’s past, featuring 27 original and reproduction homes, businesses and landmarks, including paved streets, running trolleys and a café. Even the tourist-marketed Winchester Mystery House offers an interesting look at architecture and life in late 19th to early 20th century San Jose. Starting in the 1970’s, the region became much more valuable for housing computer research and semiconductor manufacturing firms than for farming. Many innovations that helped make computers smaller, faster, and cheaper started here, and the use of silicon in those semiconductors led to post-agricultural Santa Clara Valley being renamed “Silicon Valley”. Local arts groups and cultural organizations never shy away from talking about the darker parts of the city’s history. 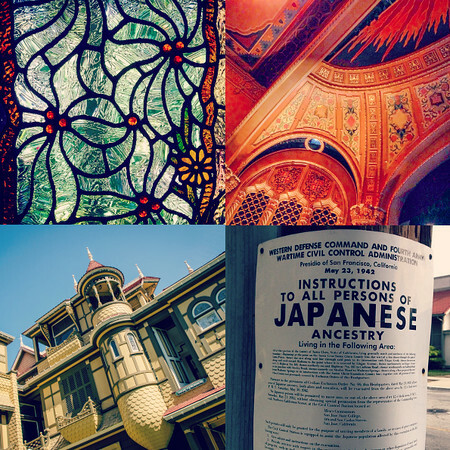 The Japantown community and the Japanese American Museum, in particular, has focused on remembering the mass imprisonment of Japanese Americans during WWII. 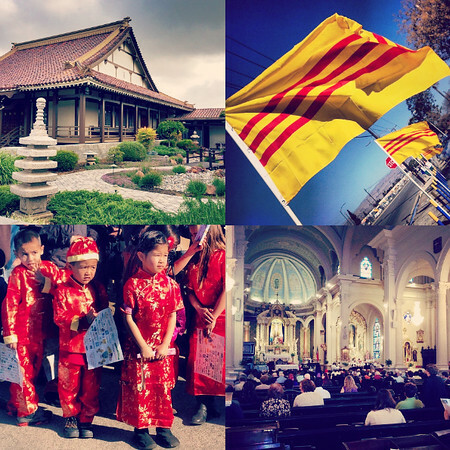 San Jose has the largest Vietnamese community outside of Vietnam, and in a city-wide anti-communist show of support, local Vietnamese businesses fly the red and gold pre-1975 South Vietnam flag, and named their local business district “Little Saigon“. While in the past you may have needed to go to San Francisco for exciting restaurants and dining opportunities, San Jose has a lot of excellent restaurants, culinary venues, and a very creative food truck culture. The city has top tier restaurants downtown like award-winning restaurant Arcadia, and in nearby Santana Row, the Left Bank Brasserie. 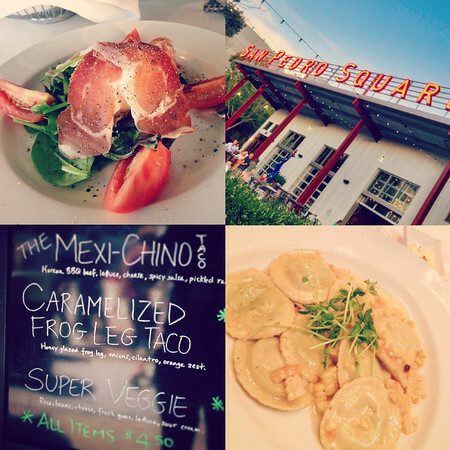 For more casual fare, the San Pedro Square Market opened in 2011 and right away, it became the place for dining and nightlife in San Jose. This brick-clad central market space was inspired by some of my favorite urban food markets such as Seattle’s Pike Place market and San Francisco’s Ferry Building. The market features tons of diverse food vendors, cafes, wine bars, and beer bars. It’s the first place I take any foodie friends visiting San Jose. There is excellent authentic food in the ethnic business districts like Japantown and Little Saigon, and in some favorite neighborhood restaurants like the Naglee Park Garage. Our local food truck association recently sponsored the second year of the Taco Festival of Innovation (taco-“inspired” dishes), a Bacon Festival, and the Electric Sriracha Festival (a food and electronic music festival featuring the bottled hot chile sauce that has a cult-following). 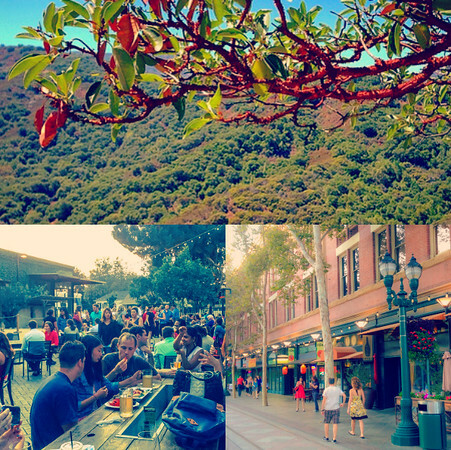 When I moved here seven years ago, I was pleased to find that San Jose is very livable city. It’s easy to get around, thanks to the support of voters and responsible public agencies, we have a walkable downtown, decent public transportation system (downtown) and a fast growing network of bike lanes and transit connectivity. Local governments have done an excellent job of protecting outlying green space from urban sprawl and we have lots of urban and regional parks and hiking trails. The community gets involved, we have tons of local festivals and diverse local events, and we have the best weather in the Bay Area–perfect year round! San Jose is a close drive to all the best things in Northern and Central California. And I’ve forgotten to mention, while still not a budget place to live, San Jose is more affordable than almost anywhere else in the Bay! Have you ever visited San Jose? I feel SJ is like if Orange County and East LA mated. The flatness and way too many “little” freeways remind me of the OC, but the ethnic diversity reminds me of home (E-LA)!! Let me know if you want to meet up for a doggie date soon near you!! I think I see the back of my head 🙂 I love living in downtown SJ too. and she’s afraid, it would be raining all the time. SJ haven’t been myself heard nothing but good things and you’ve outlined a few as well. It’s definitely a place in Cali that I’ll have to visit. Hi. I really enjoyed reading your post about SJ. My family is moving to the SJ area at the end of July from Oklahoma. I’m very nervous about the move but reading your post has helped settle some of those nerves a bit. I’m very excited about this new adventure and chapter of our lives. Thanks for sharing. Hi Karen, I’m so glad you enjoyed this post! I love San Jose, and am glad to hear you’re planning a move out here. If you ever have any questions, don’t hesitate to reach out. I’m happy to help by email or meet up for coffee when you arrive in town: http://www.everintransit.com/contact/ I know how hard it is to get settled in a new place! Thank you for the read. My husband just excepted a job in San Jose and I will be joining him at the end of the school year all the way from the east coast (charleston, sc). Nervous and excited about moving out west.